Start the Layar application and open the 'AR exhibition' layar. Do so by searching for keywords like: 'ar', 'art', 'MoMA' etc. Your mobile phone now turns into an Augmented Reality viewer. Study the compass on the screen, and point your mobile phone in the direction of the white dots. These indicate the location/direction of the artworks. Click on the 'filter' icon and then on 'CHOOSE FLOOR'. You will see all works on one floor at the time. 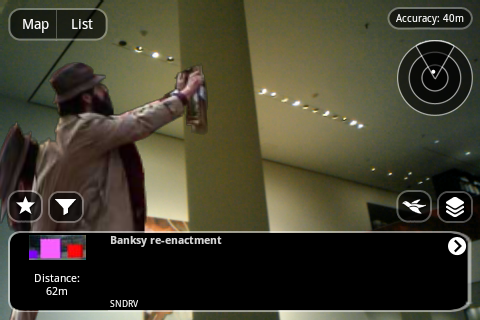 Above: sample screenshot of viewing augmented reality items using the Layar application. Compass is on the right top. Filter icon is second on the left at the bottom of the interface. Impact of AR on our public and private spaces? gesehen in DenHaag beim todaysart festival.